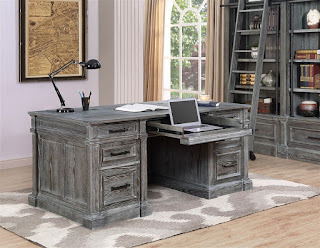 The Gramercy Park Collection by Parker House is made of Poplar Solids and Oak Veneers in Vintage Burnished Smoke Finish. The pieces feature rustic traditional style with planked details and picture frame molding. The Double Pedestal Executive Desk has a drop down keyboard tray, box and lateral file drawers as well as charging station. Matching Lateral File is available as an option. Check out matching entertainment also available in this collection. To view the entire Gramercy Park Collection click here.